I have been asked to post the recipe for my Christmas Eve navy beans in the clay pot, and here it is! In a 5 qt clay pot- 4 qt water. 1. Wash and drain the beans, then place them in a regular cooking pot with 1.5 quarts of water to boil. When it boils, drain the beans in a colander and repeat one more time. 2. After the beans have been boiled and drained twice, add all of the ingredients from the first list together in the clay pot or slow cooker ( navy beans, red onion, white onion, garlic, sun dried tomatoes, peppers, celery sticks, carrots, dry or fresh mint/peppermint, salt, black pepper to taste and water). * If you are using a slow cooker- place all of the ingredients in it and use the program that is for 6 hours on high. 3. After the beans are fully cooked, add the tomato paste and crushed tomatoes. * In a slow cooker - start a new 4 hour program on high and cook for 1 more hour, then turn off. 4. Place the olive oil in a small pot on the stove on high, then add the red pepper until the mixture is sizzling ( be careful not to burn it, you have to work very quickly). Get a big ladle and start adding beans from the clay pot ( or slow cooker) into the small pot as stirring the olive oil and red pepper well. 5. When the small pot is full of beans, add them all back to the clay pot or slow cooker. * if using a clay pot- stir the beans in the clay pot well, turn off the oven and leave the pot inside until serving time. * if you use slow cooker- stir the beans in the slow cooker and switch the temperature to " Keep warm" until serving time. Best serve warm with freshly baked bread and pickles.You can garnish with bacon, sausages or ribs too if you eat meat. 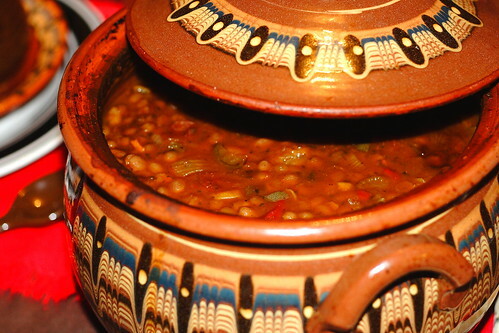 I miss Bulgarian food and their beautiful clay pots. Sarah, as a matter of fact, I bought this Bulgarian clay pot ( and a whole set of plates and cups)in the US. There are a lot of Bulgarian stores, online and offline where you can find Bulgarian products. Thank you for the great recipe! Request-do you think you can post links to online site where I can purchase clay pots on reasonable prices? Thank you,it will be much appreciated!! Do you know where to get pots that are a little bigger...the link above only has the 16 oz. sizes...thanks! Oh, I am so sorry to hear that, they probably ran out. No, I really don't know another place that carries them. You can contact the store and ask them to order one for you, I am sure they will oblige. Is the inside of the pot glazed as well? Ks, yes it is. 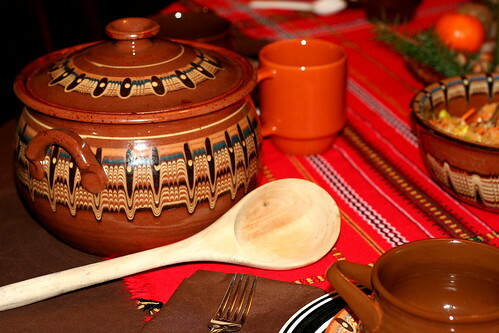 It is traditional Bulgarian pottery that's been used for centuries. I can provide a link if you like, it's really fascinating how they create them.